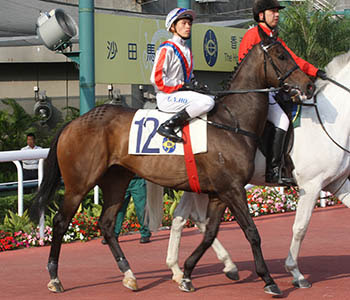 Somewhat fitting given the acquisition of Eliza Park by Hong Kong based Sun International Group last week, Bel Esprit sprinter, Sparkling B, certainly was sparkling over 1200m at Sha Tin on Sunday. Caught behind a wall of horses turning for home in the HK$950,000 Audemars Piguet Handicap, the 4YO found some room under the skillful hands of Tye Angland and flew home to grab the verdict. It was Sparkling B’s fifth run in Hong Kong since arriving on the scene in February and the Tony Millard trained flyer clearly has his share of ability. Sparkling B is out of the Marauding mare, Gypsy Marauder, and is linebred to Vain through two daughters. Winning two races in Victoria for Shane Nichols before being exported, Sparkling B also hails from the family of multiple Group One winner Zarita and Hong Kong Group One winner Joy And Fun. Click here for a replay of the win.